Designation: Department of Internal Medicine, Hospital Clinic, Institut d’Investigacions Pi i Sunyer (IDIBAPS), University of Barcelona. List of Author(s): Fernández-Sola J, Toll-Argudo M, Tobías-Baraja E, Moreno- Lozano P, Ferrer-Curriu G, Guitart-Mampel M, Planavila-Porta A, Garrabou-Tornos A. Copyright: © 2018 Fernández-Solà J. This is an openaccess article distributed under the terms of the Creative Commons Attribution License, which permits unrestricted use, distribution, and reproduction in any medium, provided the original author and source are credited. Aims: Cardiomyopathy (CMP) with a reduced ejection fraction develops in a dose-dependent manner in one-third of subjects with a long-term history of heavy daily alcohol consumption. Ethanol alters heart transduction signals including excitation-contraction sarcomeric coupling, causing diastolic and systolic left-ventricular (LV) dysfunction. Titin is a giant structural sarcomeric filament macro protein involved in contractile heart function and contributes to cardiac myocyte elastic recoil, a key factor for diastolic LV filling. We evaluated whether titin expression is affected by chronic highdose ethanol consumption in alcoholic CMP. Methods and Results: We analyzed a total of 30 heart samples from human organ donors: 20 from high alcohol consumers (10 without CMP and 10 with CMP) and 10 healthy controls. Patient evaluation comprised daily and lifetime ethanol consumption, chest X ray, 2-D echocardiography and LV histology. CMP was assessed by functional and histological criteria. Titin activity was evaluated by specific immunohistochemical (IHC) and transcript expression (rtPCR) assays. Titin IHC expression was clearly present in sarcomere areas of myocytes. Compared to healthy donors (82.58 ± 3.36), alcohol consumers showed a significantly lower cardiac titin expression (71.29 ± 3.16; 13.67 ± 3.83% decrease; p=0.04), being significantly lower in alcohol consumers with CMP (62.31 ± 4.18; 24.54 ± 5.06% decrease, p<0.0009), compared to both their counter-parts without CMP (80.27 ± 2.62; 2.80 ± 3.17% decrease vs. controls; p<0.0030 vs. alcoholic CMP). Titin transcript levels confirmed similar patterns of expression. Conclusions: Cardiac sarcomeric titin expression is diminished by chronic alcohol consumption, especially when CMP has been developed. Titin is involved in the multifactorial pathogenic process of alcoholic CMP. Alcohol, Pregranulin, Myocardium, Titin expression, Cardiomyopathy. Alcoholic cardiomyopathy (CMP) is characterized by a dilated left-ventricle (LV) phenotype in subjects with high-dose persistent alcohol consumption [1-3] which is similar to genetically-linked cardiomyopathies. Twenty-three to 47 % of all dilated CMPs in developed countries are related to alcohol misuse , and this disease develops in a cumulative, dose-dependent manner [5,6]. It is found in one-third to one-fourth of long-standing excessive alcohol consumers who have a mean lifetime cumulative ethanol dose >10 Kg ethanol/Kg body weight) [1,7] and it is the cause of high morbidity including arrhythmias and episodes of heart failure [8-10]. Excessive ethanol consumption exerts progressive, multifactorial damage to the myocardium inducing a diversity of noxious effects [3,7,11], most of which are synchronous and synergistic  and are only partially understood [11,12]. In the natural history of alcoholic CMP, these pathological mechanisms first produce diastolic [13,14] followed by systolic myocardium dysfunction , with progressive chamber dilatation and the development of structural changes (myocyte hypertrophy, necrosis and interstitial fibrosis), leading to myocyte apoptosis and cell loss, inducing the so-called alcohol-dilated CMP [1,4,7]. One of the most relevant mechanisms of alcohol-induced heart damage is related to the disruption of structural myocardial proteins [15,16]. Alcohol decreases the synthesis of panoply of cardiac proteins, modifies their expression and function and increases its degradation . Myofibrillary proteins are one of proteins most frequently affected in this process. Thus, actin and α-myosin are decreased by 40%, with a reduction of their mRNA transduction process in rodent models , causing a progressive decrease in sarcomere contraction, ventricular dysfunction and progressive cardiac functional damage. Alcohol-induced heart damage also involves other structural (troponin, ankyrin, desmosomerelated proteins), non-structural (mitochondrial, ribosomal, heat-shock proteins) and regulatory cardiac proteins (myostatin, IGF-1, FGF21, other cardiac myokines) [7,16-22]. This sequential process of alcohol-induced heart damage is relevant in the evaluation of the role of each specific protein . Titin is a giant structural sarcomeric filament macroprotein which has shown to be clearly involved in contractile heart function [23-25]. This macroprotein is functionally related to passive myocardial stiffness and stress-sensitive signaling  and largely contributes to the elastic recoil of cardiac myocytes, a key-determinant factor in Frank-Starling relaxation, which is involved in diastolic left-ventricular filling [24,25,27]. Titin force, together with extracellular matrix, define passive myocardial stiffness [26-28]. Thus, titin plays a major role in heart disease and is involved in structural CMPs such as inherited dilated and hypertrophic CMP , and arrhythmogenic right ventricular dysplasia . The potential involvement of titin in human ischemic heart disease , and the role of titin in diastolic heart failure al [32,33] have also been described. In fact, the term “cardiac titin diseases” has been used to include the diverse heart diseases related to mutations, isoform variants, posttranslational modifications, hyperphosphorylation and upregulation of normal titin proteins involved in titinrelated heart damage . Changes in gene expression and titin content (connectin) have been reported in experimental studies in striated muscle of chronic alcohol-fed rats [34,35]. The process of passive myocardial stiffness and stress-sensitive signaling has been described in the first steps of the natural history of alcoholic CMP [27,32], and echocardiography has shown diastolic dysfunction in one third of chronic asymptomatic men consuming a total lifetime dose of ethanol >5 kg Ethanol/kg body weight . There is recent evidence that titin truncating variants represent a prevalent genetic predisposition for alcoholic CMP, and are also associated with a worse left ventricular ejection fraction in dilated CMP patients who consume alcohol above recommended levels . However, Titin involvement in alcoholic CMP has been scarcely explored until date. Therefore, we hypothesized that heart titin content and function may be affected by ethanol in the progressive pathogenic process of chronic alcoholic CMP. The aim of the present study was to evaluate the potential involvement of the myocardial structural sarcomeric protein titin in alcohol-induced heart damage. We used tissue of human myocardium from heart donors and compared the degree of titin myocardial expression either by immunohistochemical (IHC) or transcript levels methods in heavy long-term alcohol consumers with or without CMP versus nonalcohol consumers free of heart disease (healthy control donors). In a prospective five-year study from January 2006 to December 2011, we consecutively studied hearts from subjects with traumatic or cerebrovascular brain death considered suitable as organ donors by the transplant team of the Hospital Clínic of Barcelona (Barcelona, Spain). Myocardial structural and functional data and histological samples were obtained from age-matched (+ 2 years) human organ donors prior to and after transplantation surgery, respectively. Of 120 cadaveric donors under 70 years of age, 62 hearts were not suitable for transplantation and 4 samples were not properly recruited. Of these 58 latter organs, we finally selected: (i) 20 donors with a history of ethanol intake ≥ 60 g/day for more than 10 years (10 without CMP and 10 with CMP), and (ii) 10 control hearts from healthy people not eligible for implantation because of a lack of matched receptor or inadequate size. All cases were admitted to the Intensive Care Unit where ventilatory and hemodynamic parameters were appropriately maintained at normal values throughout hospitalization: systolic blood pressure >100 mmHg, PaO2>60 mmHg, and arterial pH within the normal range. None of the patients required in-hospital cardiopulmonary resuscitation maneuvers. All the donors were white Caucasians of Spanish descent, who lived with their families in or around Barcelona, and none was indigent. The study protocol was approved by the Ethics and Research Committee of the Hospital Clínic of Barcelona (reference number HCB/2012/8005) and all the donor families provided informed consent for the use of myocardium tissue in this study. All procedures in patients follow the guidance provided in the Code of Conduct and Best Practice Guidelines for Journal editors and Code of Conduct for Journal Publishers (COPE), as well as the principles outlined in the Declaration of Helsinki. One third of these subjects had been included in previous studies on cardiac myostatin activity  and myocardial IGF-1 activity . Using a structured questionnaire (“time-line followback method”) , a detailed history of ethanol intake was retrospectively obtained by consultation with family members, as previously reported in similar studies [5,19,38]. The duration of ethanol intake was calculated in each group as the total cumulated period of recent or previous alcohol consumption in years. The body mass index (BMI) was determined as the current body weight relative to the square of the body height (BMI, Kg/m2). Patients were considered to have caloric malnutrition if the BMI was < 17 Kg/m2. Protein malnutrition was assessed by the following parameters obtained at hospital admission: hemoglobin, lymphocyte count, total protein, retinol-binding protein, pre-albumin and albumin. Symptoms of heart failure and risk factors including smoking history, diabetes, cerebrovascular disease, hypertension and a history of ischemic heart disease were determined by clinical chart review, and the functional class was determined according to the American Heart Association Criteria . Chest X-ray with measurement of the cardiothoracic index, conventional electrocardiography (ECG) and bidimensional echocardiography was carried out (Hewlet Packard Sonos 2500, USA. End-diastolic andsystolic diameter indices, the shortening fraction, left ventricular (LV) mass, and the ejection fraction (EF) were measured according to the standards of the American Society of Echocardiography . CMP was defined as the presence of a left ventricular ejection fraction (LVEF) <50% and significant LV enlargement in addition to histologically evidenced structural cardiac damage. The personnel who performed and evaluated these tests were blinded to the alcoholic history of the patients. Stainings: To perform myocardium histological studies, a distal 3 cm sample of the LV apex was surgically excised (total weight of 4-5 g) with the donor under cold perfusion. The specimen was cut into fragments, and one of these was processed for further transcriptional studies, and maintained frozen at -80ºC. The remaining fragments were snap frozen using liquid nitrogen until IHC study. For the histological studies, the specimens were stained with hematoxylineosin (H&E) and toluidine-blue in semi-thin sections. Two independent observers (JF-S and P-M), who were blinded to group assignment, evaluated the degree of myocardial cell and nuclear hypertrophy, myocytolysis (defined as the presence of myofiber disarray or cell vaquolization) and interstitial fibrosis as reported previously . In case of discordance, consensus agreement was established. The degree of global histological involvement was graded as normal, mild, moderate, or severe (0/+/++/+++) according to previous histologically defined criteria [38,41]. 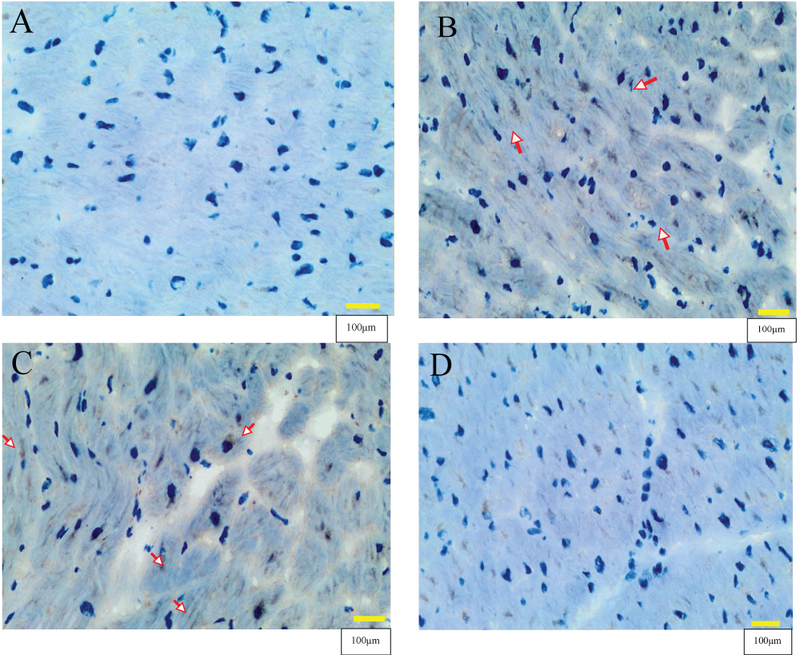 Myocardial titin expression was evaluated using conventional IHC procedures. In these, assay titin polyclonal expression is observed by microscopic examination as a slight brown pigment in sarcomeric areas of the cardiac myocytes in the presence of the protein. The intensity of expression is directly related to sarcomeric titin content . Semi-thin cryostat sections of 6μm was obtained from the donor heart samples with ultra-microtome and fixed by paraformaldehyde 4% PBS solution during 30 min. at pH 7.40. After PBS washing, the sections were permeabilized with 0.1% Triton X-100 sodium citrate solution for 2 min at 4ºC and washed with serum for 20 min. Incubation with anti-titin horse polyclonal serum (Abcam 7034, Cambridge, UK) was performed at 4ºC for 18 h.
The next day, PBS/Triton 0.1% solution was applied for 5 min followed by incubation with secondary biotin antibody for 30 min at room temperature and the washing solution was repeated. Thereafter, the sections were incubated with ABC (Avidin-Biotin Complex, Vectron PK-7200, Burlingame, CA, USA) for 30 min at room temperature and washed again in PBS/Triton 0.1% solution. Revealing was performed with diaminobenzidine chromogen subtract for 10 min, under microscopic control, followed by 5 min of PBS/Triton 0.1%, and was then washed with distilled water and stained with H&E. After dehydration of the samples they were covered by DPX mounting solution for histological study. Negative control slides were made in all the procedures using the same process without reagent incubation. Titin quantification was performed by two different qualified observers (JF-S and P-M) in at least 6 different fields (magnification 250x) of each sample, with at least 500 myocytes per field, according to a previously described method . The titin IHC index was calculated by dividing the total number of highly positively stained heart myocyte cells in the titin assay by the total number of myocytes evaluated and multiplying this value by 100, as described elsewhere [19,38]. Non-myocyte cells or myocytes located at the edges of the tissues or in the interstitium were not counted. RNA isolation and Real-Time PCR. Total RNA was extracted using Tripure (Roche, Indianapolis, IN). Reverse transcriptase was performed in 20 μl, using random hexamers primers (Applied Biosystems, Foster City, CA) and 0.5 μg RNA. PCR were conducted in duplicate for increased accuracy. Each 25 μl of reaction mixture contained 1 μl cDNA, 12.5 μl TaqMan Universal PCR Master Mix (Applied Biosystems), 250 nM probes and 900 nM primers from Assays-on-Demand Gene Expression Assay Mix or Assaysby- Design Gene Expression Assay Mix (Applied Biosystems). Taqman Gene Expression Assays were used. Each sample was run in duplicate and the mean value was used to calculate the mRNA expression of the gene of interest and the housekeeping reference gene (18S). The amount of the gene of interest in each sample was normalized to that of the reference control using the comparative (2-DeltaCT) method following the manufacturer’s instructions. The data were analyzed using SPSS v22 statistical software. Differences among groups were seek using oneway ANOVA test, after checking Normality distribution of parameters by Kolmogorov-Smirnov and Shappiro Wilkoxon tests. Pearson correlation coefficients between the variables were calculated. All the variables followed a normal distribution and were expressed as mean ± standard error of the mean (SEM). A two-tailed P value <0.05 was considered statistically significant with a confidence interval (CI) of 95%. After donor assessment, we collected a total of 30 heart samples. Of these, 20 were from chronic alcohol consumers (>10 years of lifetime consumption and >60 g of daily alcohol consumption). After the cardiac studies, the samples from chronic alcohol consumers were divided into two groups: one without evidence of dilated CMP (showing LVEF >50% and no histological signs of myocardial structural damage; n=10), and another with dilated CMP (presenting a LVEF <50% and histological signs of myocardial structural damage; n=10). In addition, in the same period, 10 healthy non-alcoholic donors with no evidence of heart disease were matched with the alcoholic group by age (+ 2 years) and gender, and were also included in the study. Table 1 summarizes the mean clinical and epidemiological data of the alcohol consumer donors with and without dilated CMP and controls included in the present study. Age and gender were similar in the three groups. Protein or caloric malnutrition was absent in all the control donors studied and was present in 2 alcohol consumers with CMP and in 2 alcohol consumers without CMP, being BMIs comparable among the three groups. Twelve of the 20 chronic alcohol consumers (60%) had stable liver disease, with a moderate increase of aspartate aminotransferase (mean 62+12 IU/L) and gamma glutamyl transpeptidase (mean 73+15 IU/L) levels compared to non-alcohol consumer controls (p<0.05). As expected, daily alcohol intake, duration of alcohol intake and lifetime alcohol consumption were significantly higher in alcohol consumers with CMP as compared to those without CMP and the controls, in accordance to previous clinical series reports . Cerebrovascular death tended to be more frequent in alcohol consumers than in controls. Forty percent of alcohol consumers without CMP and all the alcohol consumers with CMP presented an abnormal function class. The cardiothoracic index, end-systolic and end-diastolic LV diameters were significantly higher, and the LVEF was significantly lower in alcohol consumers with CMP compared to their counterparts without CMP and the controls. We observed a good correlation between the cardiothoracic index and the left ventricle end-diastolic diameter (r=0.68, p<0.01). Abnormal ECG findings (LV hypertrophy, extrasystoles, defects in conduction and repolarization) were present in 40% of alcohol consumers without CMP and 70% of alcohol consumers with CMP. Table 1: Clinical and epidemiological data of alcohol consumer donors with and without cardiomyopathy (CMP) and non-alcoholic controls included in the study. Age (years) 60.0 ± 13.9 51.4 ± 7.58 54.1 ± 10.77 n.s. Gender (M/F, ratio) 6/4 6/4 6/4 n.s. Table 2 shows the degree of histological damage according to the semi-quantitative score (absent/low/ moderate/severe) applied in the histological myocardial study. As expected, alcohol consumers with CMP presented a greater degree of histological damage (myocyte hypertrophy, necrosis and interstitial fibrosis) compared to their counterparts without CMP and to the non-alcohol consumer controls (p<0.05). Table 2:Degree of histological damage and immunohistochemical (IHC) titin expression in the myocardial study. CMP: Cardiomyopathy, SD: Standard Deviation, NS: Nonsignificant, *Compared to alcohol consumer donors without cardiomyopathy and controls. ANOVA test, after checking Normality distribution of parameters by Kolmogorov-Smirnov and Shappiro Wilkoxon tests. Negative controls for IHQ were only stained with hematoxylin (Figure 1A). After processing and microscopic evaluation of all the samples for titin IHC expression, a dark brown color in sarcomere areas showed clear positivity where the titin specific antibody was used (Figure 1B). The inter-myocyte variability in titin expression was of note (Figure 1B) in that some cardiac myocytes clearly expressed titin while others showed low titin expression, where the primary antibody was not captured by sarcomere. Titin immunohistochemical cardiac studies in control non-alcohol consumer donors (n=10) and chronic alcohol consumer donors (n=20). Figure 1A: Negative heart controls only stained with hematoxylin. Figure 1B: Positive heart control with titin-specific antibody staining showing clear slight positivity by a dark brown color in sarcomere areas (arrows). Figure 1C: Alcohol consumer donor without CMP showing positive titin expression in a high percentage of myocytes (arrow), similar to the pattern from a non-alcohol consumer control. Figure 1D: Alcohol consumer donor with CMP showing a significant decrease in the immunohistochemical titin expression. Magnification x 400. Scale bar: 100μm. Figure 1: Titin immunohistochemical cardiac studies in control non-alcohol consumer donors (n=10) and chronic alcohol consumer donors (n=20). Figure 1A: Negative heart controls only stained with hematoxylin. Figure 1B: Positive heart control with titin-specific antibody staining showing clear slight positivity by a dark brown color in sarcomere areas (arrows). Figure 1C: Alcohol consumer donor without CMP showing positive titin expression in a high percentage of myocytes (arrow), similar to the pattern from a non-alcohol consumer control. Figure 1D: Alcohol consumer donor with CMP showing a significant decrease in the immunohistochemical titin expression. Magnification x 400. Scale bar: 100μm. Table 2 and Figures 1 and 2 show the cardiac titin IHC expression. First, we compared the percentage of titin IHC expression in healthy donors versus the two alcohol consumer groups, and we found that alcohol consumer donors showed significantly lower myocardial titin expression (healthy donors 82.58%+3.36 vs. all chronic alcohol consumer donors 71.29+3.16, p=0.04). Titin transcriptional expression in alcohol consumer donors with (n=10) and without cardiomyopathy (CMP) (n=10) and non-alcohol consumer controls (n=10). Results expressed in Titin RNA/18SrRNA (mean + SEM); ANOVA test, after checking Normality distribution of parameters by Kolmogorov-Smirnov and Shappiro Wilkoxon tests. 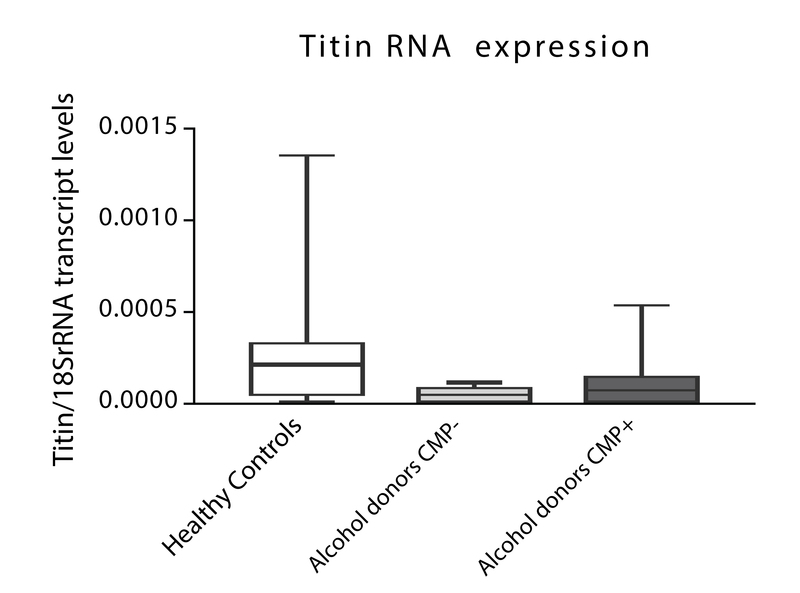 Figure 2: Titin transcriptional expression in alcohol consumer donors with (n=10) and without cardiomyopathy (CMP) (n=10) and non-alcohol consumer controls (n=10). Results expressed in Titin RNA/18SrRNA (mean + SEM); ANOVA test, after checking Normality distribution of parameters by Kolmogorov-Smirnov and Shappiro Wilkoxon tests. p=0.003). Similarly, titin IHC expression was significantly lower in alcohol consumer donors with CMP compared to healthy controls non-alcohol consumers (62.31+4.18% vs. 82.58+3.36%, p=0.0009). Figures 1C and 1D shows the different titin IHC expression according to the presence or absence of CMP. 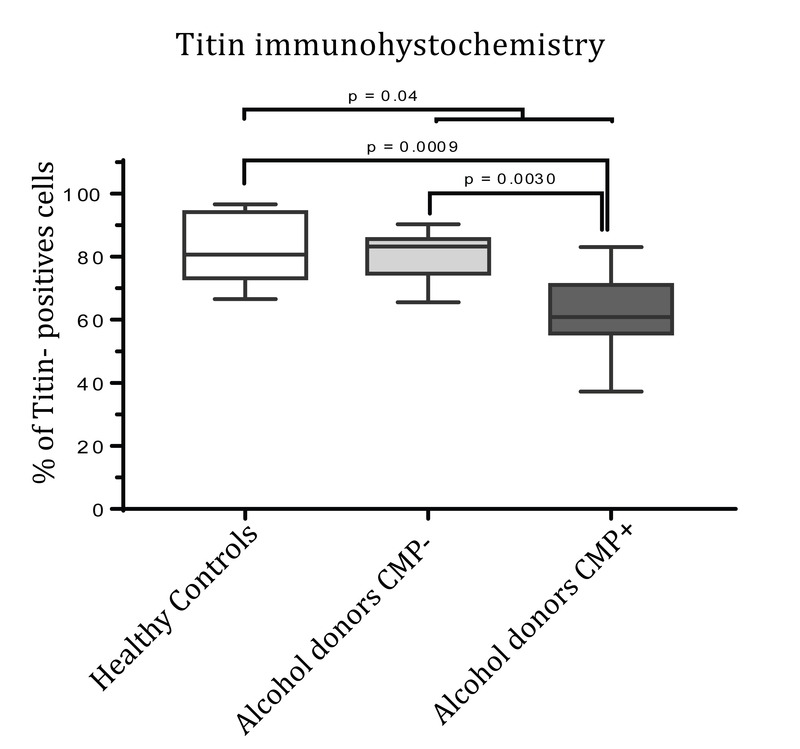 Thus, chronic alcohol consumer donors without CMP (Figure 1C) showed positive titin expression in a high percentage of myocytes (similar to healthy controls non-alcohol consumers) compared to chronic alcohol consumer donors with CMP (Figure 1D) who had a clear and significant decrease in IHC titin expression. Figure 3 shows the relationship between the different groups of donors evaluated and the percentage of myocardial titin expression (% of higher titin IHC-positive cells). Titin immunohistochemical expression in alcohol consumer donors with (n=10) and without cardiomyopathy (CMP) (n=10) and non-alcohol consumer controls (n=10). Results expressed in % of positive cells (mean + SEM); ANOVA test, after checking Normality distribution of parameters by Kolmogorov-Smirnov and Shappiro Wilkoxon tests. Figure 3: Titin immunohistochemical expression in alcohol consumer donors with (n=10) and without cardiomyopathy (CMP) (n=10) and non-alcohol consumer controls (n=10). Results expressed in % of positive cells (mean + SEM); ANOVA test, after checking Normality distribution of parameters by Kolmogorov-Smirnov and Shappiro Wilkoxon tests. To confirm these findings, Titin levels were parallelly evaluated through transcriptional assays and found similar patterns than those evaluated through IHQ, in all studied groups (Figure 3). The objective of the present study was to assess the effect of chronic alcohol consumption and the presence of CMP on titin expression in different groups of human heart donors. To that aim, we performed an IHC staining and transcriptional analysis in myocardial tissue from healthy control human donors and donors with high-dose chronic alcohol consumption to detect the expression of the sarcomeric titin protein in cardiac myocytes. As described previously, titin was clearly expressed with a characteristic brown stain [42,43] in the sarcomeric area of the majority of cardiac myocytes (83%) in healthy nonalcohol consumer control donors. On comparing healthy non-alcohol consumer controls with all the chronic alcohol consumers, we found the cardiac expression of titin to be significantly lower in donors who had consumed significant high doses of alcohol, demonstrating a direct effect of chronic alcohol consumption on decreasing titin IHC cardiac expression. In addition, when we evaluated the role of dilated CMP in alcohol consumer donors, we also observed that IHC titin decrease was significant in myocardial alcohol consumers with CMP compared to both those without CMP and non-alcohol consumer controls. These different patterns of Titin expression, despite non-significant, were confirmed by alternative techniques as transcriptional assays were we found a tendency to decrease Titin 18/SR mRNA transcription levels in those chronic alcohol consumers affected or not of CMP in comparison to non-alcoholic controls. This fact suggests that the decrease in cardiac myocyte Titin mRNA transcription content could be mainly related to chronic alcohol effect than to the presence of CMP and that protein expression is more relevant than transcript. Furthermore, the negative effect of alcohol on myocyte titin IHC expression in the presence of CMP is in concordance with what happens to other sarcomeric structural proteins such as actin and myosin that are also affected by alcohol misuse [16,44], and may be due to the cardiac remodeling process [45,46]. In the case of titin, since it is a sarcomeric protein functionally related to the cardiac relaxation process [26,47], the findings of the present study provide additional evidence of the damaging effect of chronic ethanol consumption which induces LV diastolic dysfunction in one third of chronic alcohol misusers [13,14]. However, this decreased titin myocyte expression is not specific of alcohol-induced CMP since sarcomeric titin content may also be decreased by many other causes of heart damage such as inherited hypertrophic and dilated CMP , ischemic cardiopathy  idiopathic dilated CMP , arterial hypertension [42,48] and arrhythmogenic right ventricular dysplasia . In fact, the term “cardiac titin diseases” has been proposed and includes all cardiac diseases involved in titin dysfunction . Similar to that happens at a clinical level, different experimental studies in rats have evaluated whether chronic alcohol consumption disrupts myocardial contractile proteins [12,15,44]. Specifically, alcohol decreases the α-actin isoform and the myosin heavy chain by 40% but increases the β-actin isoform . Changes in gene expression and isoform composition but not in total titin content in cardiac muscle of chronically ethanolfed rats have been described, suggesting that these changes are involved in the development of pathologic processes . In accordance to what happens with these myofibrillary proteins, several non-structural myocardial proteins involving mitochondrial function, membranerelated proteins, glycolytic enzymes, transduction-signal sarcoplasmic proteins, genetic transduction-related proteins and antioxidant mechanisms are affected by chronic alcohol consumption [12,16]. In addition, a clear decrease in heatshock proteins also develops, producing a loss in myocardial protective mechanisms . With respect to titin, in experimental studies in rats, titin cardiac isoform expression was decreased in LV with increased hypertrophy  or in the presence of pulmonary hypertension . A reduction in titin may produce sarcomeric insufficiency and contribute to the development of dilated CMP . Thus, the multiple effects induced by ethanol itself in cardiac myocytes  are further increased when structural proteins such as titin are altered. With respect to study limitations, since this study was performed in human heart donors, the sample size was limited due to the difficulty in obtaining this type of human specimen, and this may minimize some group comparisons with difficult statistical findings, in case of transcriptional assays. No other changes in posttranslational modifications of titin, phosphorylation or titin genotypes were analyzed in this study. Epitopes of Titin may affect the binding specific of the anti-titin antibodies used in this study . Therefore, changes in titin expression are merely associated with alcoholic CMP and do not demonstrate a causal relationship between titin and alcoholic CMP. Similarly, evaluation of diastolic function was not included in the cardiac assessment of the donors. Lastly, alcohol consumption was retrospectively evaluated by consultation with family and relatives of heart donors. Despite these inconveniences and according to the results of the present study, we can conclude that chronic excessive alcohol consumption significantly decreases titin myocardial expression, with this alcohol-induced effect being higher when structural cardiac damage and remodeling are present. Since titin is a structural protein related to LV distensibility, this decrease in titin expression may justify the previously described LV diastolic dysfunction reported in one third of chronic alcohol users in the subclinical phase of CMP [13,14]. This fact may also be related to the development of the so-called heart failure with preserved ejection fraction [33,48,49]. Titin cardiac expression may be used as an additional marker of alcohol-induced heart damage which appears in first steps of subclinical alcohol-dilated CMP. Indeed, cardiac expression of titin significantly decreases in the process of cardiac remodeling and dilated CMP. Strategies to preserve myocardial titin activity as well as other cardiac proteins, avoid protein malnutrition, lack of physical exercise, and oxidative damage, and stabilize liver or other alcoholrelated systemic diseases  may contribute to preventing the progressive development of cardiac dysfunction and structural damage in alcoholic CMP. This work was supported by grant Suport Grups de Recerca 2014-1158 from the Generalitat de Catalunya; Fisiopatología de la Obesidad y la Nutrición, Instituto de Salud Carlos III, Madrid. Spain and La Marato TV3 2015/33 30/31 Generalitat de Catalunya.